Eddie Bauer Canada wants to keep you warm in this breezy Winter season by offering an end of season Winter sale. You can save up to 60% off on everything, including both clearance and regular price women’s and men’s styles. Some exclusions apply. You can save up to 60% off on men’s and women’s outerwear. Both offers are valid for a limited time only, while quantities last. Not to mention, you can save an extra 40% off on clearance styles by entering the promo code PEAK40 at checkout. 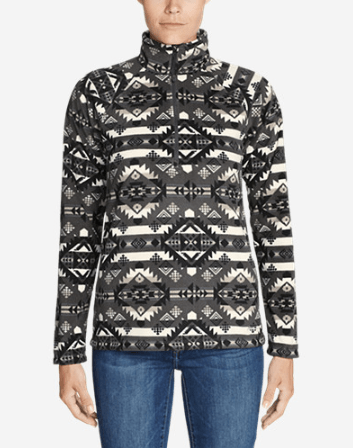 This Women’s Quest Fleece 1/4-Zip – Printed is on sale for $59.99. When you enter the promo code at checkout, you can save an extra 40% off and pay only $35.99. That’s a total savings of $54.01 from the original price of $90.00! Comfortable, quick-drying, 200-weight polyester fleece adds lightweight warmth and won’t absorb moisture. Eddie Bauer Canada offers $10 flat rate shipping on all orders with no minimum purchase.